We're excited to add two great culinary experiences to The Reefs' event lineup! Both hosted by Executive Chef Douglas Sisk, we're offering a Chef's Table dinner on Wednesday, June 4 and a Cooking Class on Saturday, June 7. Join us in the Royston's Dining Room at 7:00 p.m. this Wednesday for our first ever Chef's Table. 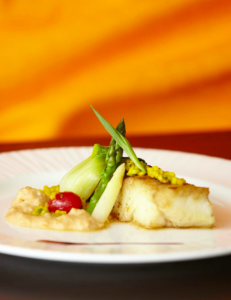 An exclusive dinner party, Chef Douglas will entice your palate with wonderfully creative local fare at and elevated fine dining level. The Chef's Table will feature a mouth-watering 8-course menu with hand-selected wine parings for just $95. * This is a Reefs event that you can't miss. You also don't want to miss your chance to learn how to cook like a pro at our first Reefs Cooking Class on June 7 from 1:00 p.m. to 2:30 p.m! We will illustrate the creative culinary techniques behind the 3-course lunch you will be preparing as you indulge in a complimentary glass of Prosecco. This live cooking demo experience will only cost you $45. We would love to set a place at the table for you, for both events, but there is limited seating available. Don't hesitate to make your reservation for either event today by emailing guestservices@thereefs.bm or calling 441.238.0222. Check back on our Facebook Page for a recap of Chef Douglas's new events and for future Chef's Table and Cooking Class Dates!